More than 130 pages of data and graphics! More than 100 questions answered! Information broken down by region AND by profession! ~ What is the amount of an average sale? ~ What is the breakdown of sales in the different categories of products? ~ Who are the industry leaders in frames, lenses, contact lenses and accessories? ~ What brands are consumers asking for? ~ What are the top sellers? ~ How are professionals being solicited and how many suppliers are they dealing with? ~ How much are they spending? 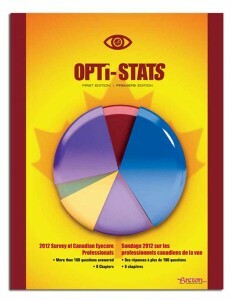 The 2012 Survey of Canadian Eyecare Professionals answers all this and MORE! IT IS NOT POSSIBLE TO DOWNLOAD MULTIPLE REPORTS FROM ONE ORDER. PLEASE PURCHASE SURVEYS THROUGH INDIVIDUAL TRANSACTIONS. Or CLICK HERE to send us a purchase order! IMPORTANT – If you do not have an existing PayPal account, please select the option to create one after you choose to check out. Your payment will be immediately processed once your account is created. The report will then be available for download. Breton Communications launched the first-ever, web-based survey of Canadian eyecare professionals in May 2012.Email invitations to participate were sent to over 4,900 vision care professionals and retailers. More than 960 professionals (nearly 20%) started the questionnaire and over 530 completed it, giving the survey a 57% completion rate. Using an online sample size calculator and an approximate population of 12,000 Canadian professionals, the survey represents the profession with a 4.135% margin of error and a confidence level of 95%.